Also known as Fiat Punto 0.9 TwinAir, the new Fiat Punto 2012 offers the prospective buyer no less than 10 different engines to choose from. On top of this, the engines use Fiat’s MultiAir valve control, a highly sophisticated innovation that has the mission of minimising the response time of the engine. One of the engines that you may consider for your new Fiat Punto is the 84bhp, 875cc, TwinAir two-cylinder turbocharged engine that can also be found on Fiat 500. The standard equipment of the new Fiat Punto include Radio with CD MP3 Player, remote control central door locking, Blue&Me (Bluetooth + USB), height adjustable steering wheel, 15" steel wheels with full wheel cap, BAS (Brake Assistance System) and more. Some of the options you can choose include body coloured electrically adjustable heated door mirrors, metallic paint, 60/40 split, folding rear seat, fog lights, front side airbags and 15" Sportline alloy wheels. On the inside, the car feature revamped interiors that include an embroidered TwinAir logo on the front headrests as well as grey and black “Sportex” fabric. The Blue&Me technology is an innovation developed by the Italian manufacturer that allows the driver to get road directions, listen to music and make phone call without the need to remove their hands from the steering wheel. The Blue&Me technology comes as a standard on all new Fiat Punto versions. 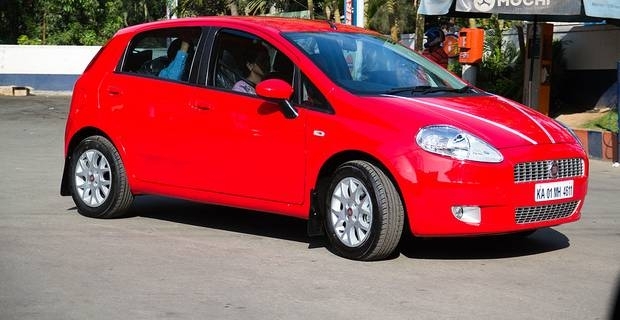 The starting price for the new Fiat Punto 2012 is £9,900 for the entry level models, going up to £15,600 for the Lounge 1.3 MultiJet, the top end model.